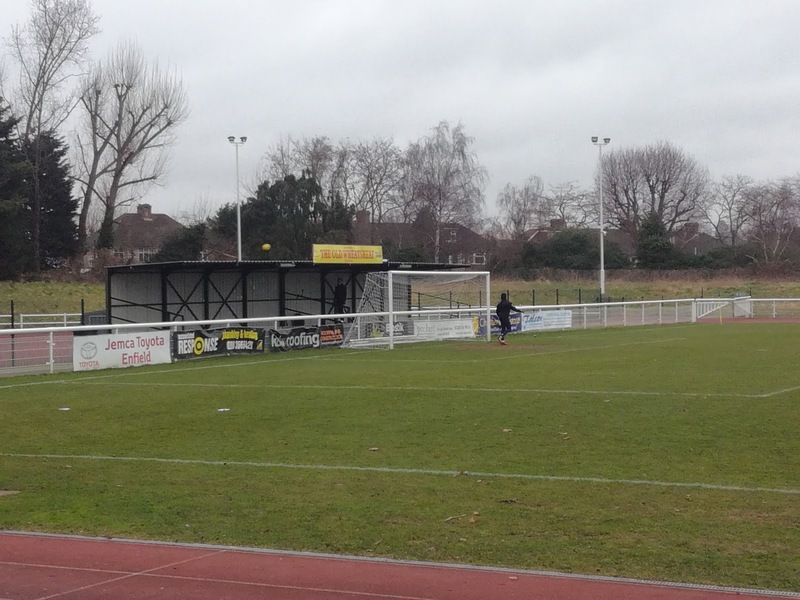 Continuing the theme of ‘when I was a lad’, Enfield Football Club were one of the biggest names in non-league football when I started to foster an interest in the game. It was the early eighties, Isthmian League Champions, Alliance Premier League Champions twice, FA Trophy winners twice, the Third and Fourth Rounds of the FA Cup in successive seasons, it was incredible! I apologise, Enfield weren’t one of the biggest names in the non-league football, they were the biggest at the time, end of. Even when they got relegated from what had now become the Conference, in seven successive seasons in the 1990’s they never finished below third in the Isthmian League. 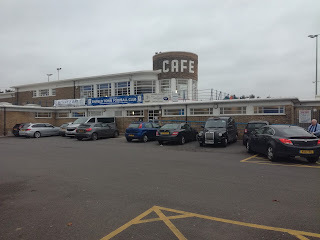 But, in 2001 they left their iconic Southbury Road stadium and began a nomadic existence. These things rarely work, and by the end of the 2006-07 season Enfield Football Club went into liquidation, but the officials chose to form a new club who ultimately would become Enfield 1893, and they remain today playing in the Essex Senior League. Clearly disillusioned by the sale of Southbury Road and the direction the club was moving in, in 2001 a group of fans formed Enfield Town Football Club. An approach was made to Enfield 1893 regarding working together but terms could not be agreed. 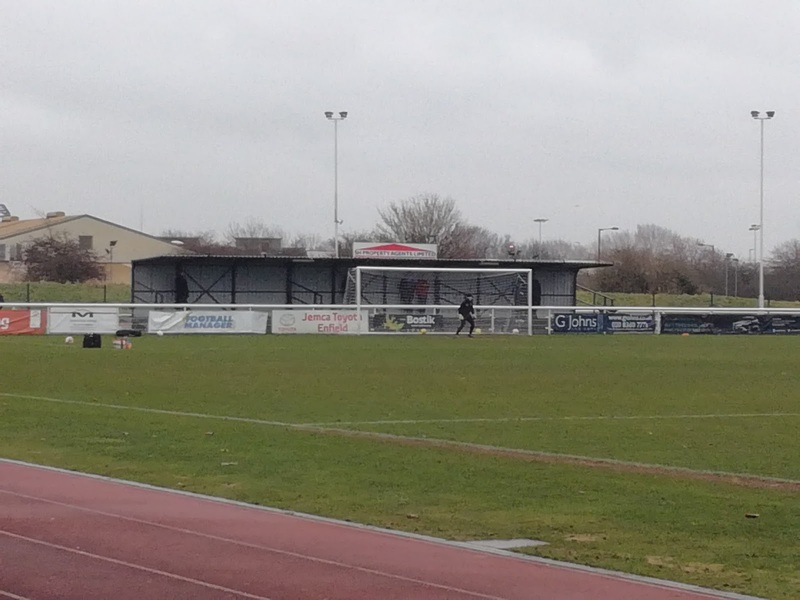 The traditional support base were right behind Town though, starting in the Essex Senior League and playing at the ground of Brimsdown Rovers. 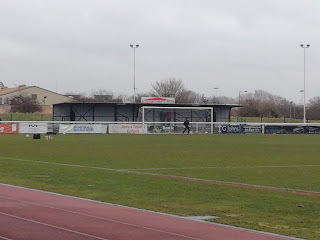 Success followed, they won promotion to the Southern League, found a home back in the Borough of Enfield in the shape of the Queen Elizabeth II Stadium on Donkey Lane, and finally moved into the Isthmian League before winning promotion to the Premier Division in 2012 via the Play-Offs. And this is where we are today, something of a sorry tale but with a happy ending. Enfield in their day were huge rivals with neighbouring Barnet, and of course Wealdstone, who it appears were rivals with everyone! The North London triumvirate have all gone in different directions, with both Barnet and the Stones competing at a higher level than Enfield, but, at least Enfield can say they play in their own Borough, unlike the others. Enfield Town Football Club on first impressions is a thriving organisation, that became apparent from the moment you walk through the turnstiles to the moment you exit the car park. Blessed with good support anyway, nearly 400 attended today’s game, they are also not short of bodies to help run and administer the club. 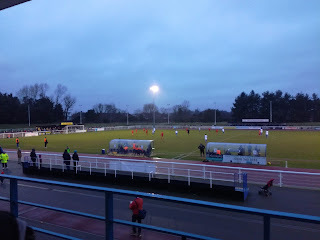 Football, even at non-league level, has changed hugely over the past few decades, and being realistic, a return to former glories whereby they could dream of a possible promotion to the Football League is perhaps beyond them, but I see no reason why they couldn’t make the move to the National League South. The stadium on Donkey Lane is a cracker. I must admit to not being a fan of athletics arenas, but Enfield have made a fantastic job of it. The focal point is the fabulous Art Deco style building that adorns the entrance and also incorporates the bulk of the clubs facilities. To enter the building you rise up a spiral staircase into what is effectively a circular turret, before a space opens out in front of you which leads to the clubs bar. The balcony out the front is used as a viewing area and is also the access route to the seating area which offers an elevated view of the action. It’s a spectacular building, and certainly goes a long way towards transforming the venue from an athletics track to a football ground. Clearly Enfield have refurbished the old building for their use, but what about the rest of the stadium? Three blocks of terracing steps have been erected in front of the stand, but much closer to the pitch, leaving a space for the running track in between. 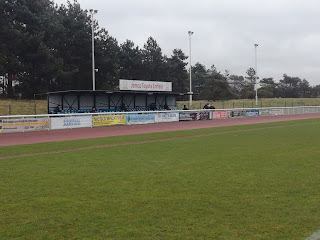 A smaller Atcost seated stand sits on the far side, while to deal with the problem of spectators being too far from the action, a barrier has been erected which runs behind both goals, with covered terraces at each end. This effectively cuts out both curves, and gives the ground a rectangular rather than elliptical feel. I liked it, very much, but what about the game? Enfield are in a season of transition, the loss of the manager and the bulk of the squad at the end of last season meant a rebuilding process had to take place. Andy Leese has come in and got them into a position whereby they sit just below the half way point in the league. The Play-Offs are not out of the question, but they will need a strong end of the season to achieve that. 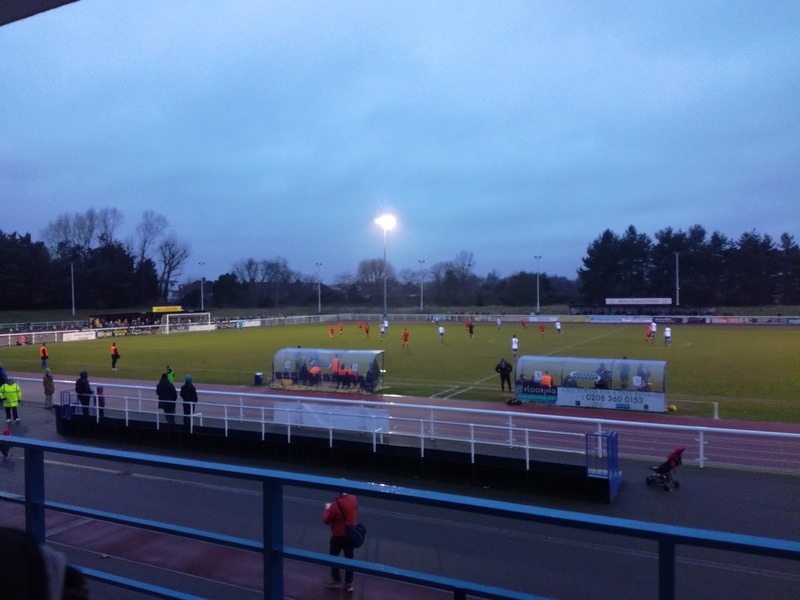 Visitors Needham Market from a small village in Suffolk are quite a story themselves, how they are competing at this level is remarkable, but that’s a story for another day. Ironically they were the side that Enfield beat when they won the Play-Offs to get to the Premier Division. After many years of unprecedented success, Market are finding it a struggle this season and sit in the bottom four. It was a damp drizzly afternoon, but the pitch was in good fettle, and that lead to a fairly even opening period, but in the twelfth minute it was the visitors who took the lead when Adam Mills rose highest in the box to plant a header past Joe Wright in the Enfield goal. Seven minutes later and disaster struck for Enfield. Caught out at the back, Wright upended an onrushing striker who was about to round him and slot the ball into the empty net. A penalty was inevitable as was the resultant red card. Daniel Morphew dispatched the penalty past stand in goalkeeper Mat Mitchell-King. An away win at that stage looked inevitable, but huge credit should be paid to Enfield who regrouped at half time and were actually the better team in the second period. Credit must also go to Mitchell-King who never put a foot wrong between the sticks and made two fantastic saves late in the game as Needham Market exploited the space and the tired Enfield legs. If Enfield had kept eleven men on the field the outcome could have been very different, but, a huge win for the visitors and a scoreline that certainly doesn’t help the hosts attempts to climb the table and make the end of season lottery. 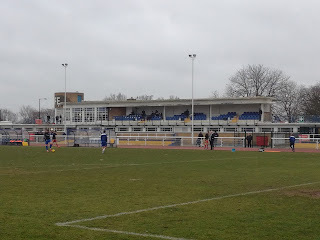 But, I guess if you are an Enfield Town fan, the fact you have a club in your Borough playing at a fantastic facility, at a very good level of football, is not to be sniffed at. In this part of the Country, too many big names have gone by the wayside, been swallowed up, or been shunted from ground to ground. Enfield – the biggest name in non-league football.